Episode 083: What's the best way to create an ebook? 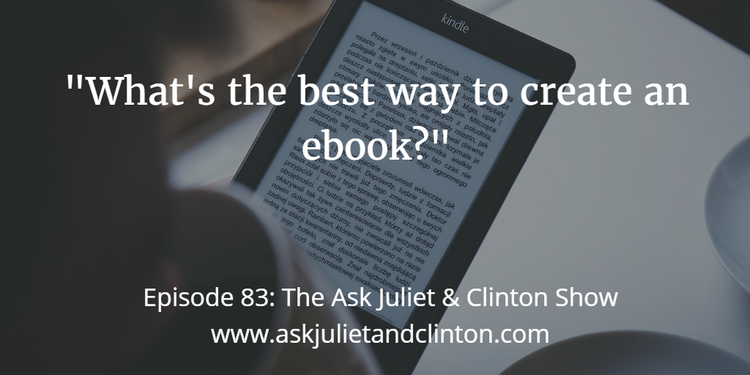 In episode 83 of The Ask Juliet and Clinton Show, Juliet and Clinton answer questions about how to encrypt emails for security, how to regain one’s website ranking after ones website has been taken down, and the best way to create an ebook. 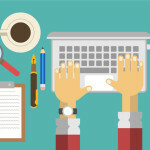 Episode 082: What are the key aspects of a strong LinkedIn profile? Episode 084: What’s the best way to promote a podcast interview? 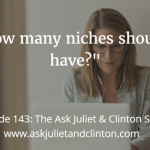 Episode 143: How many niches should I have? 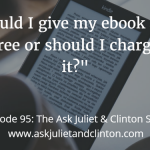 Episode 095: Should I give my ebook away for free or should I charge for it? Episode 026: How do you make time to work on the business when you have a full therapy practice? 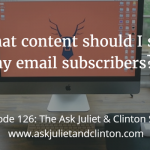 Episode 126: What content should I send my email subscribers?